…down the rushy glen – we daren’t go a-hunting for fear of little men! We were hunting mountains last week when we travelled up the west coast of Ireland with a visiting friend – finding some of the best scenery this country has to offer. 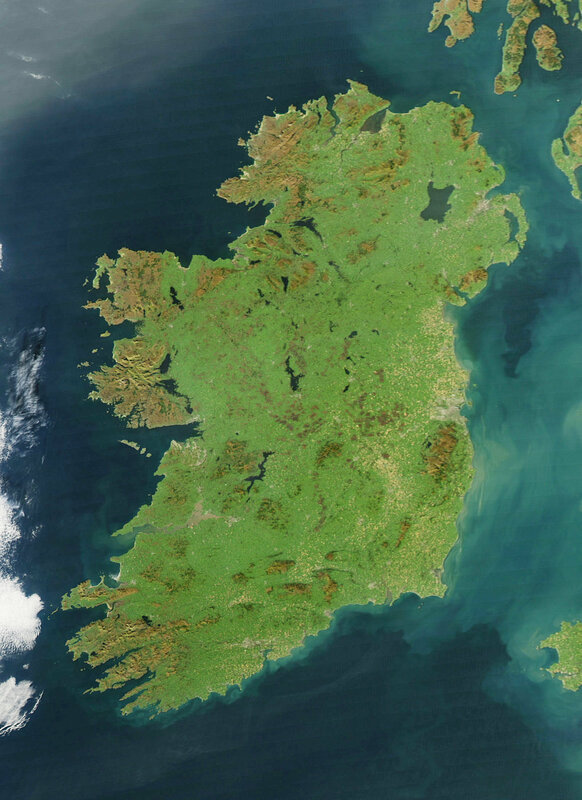 If you look down on the island from above (as in this view from NASA, below) the lie of the land is very clear: the high points are all around the perimeters, yellow and brown in colour, with lower green plains in the centre. 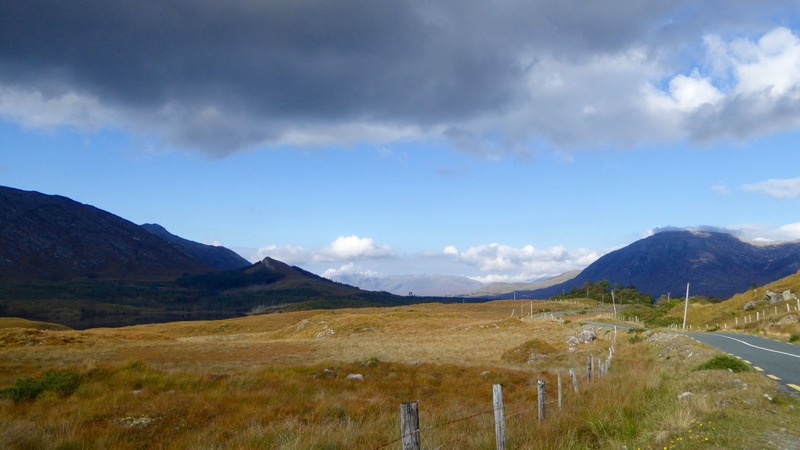 If you lived in a country like Canada, then Ireland’s mountains should seem like mere gentle slopes. Our highest peak is not too far from us, up in Kerry, Carrauntoohil (Irish: Corrán Tuathail – this could mean Tuathal’s sickle or fang, Tuathal having been a common Irish name in medieval times) and this is only 1038 metres to the summit. 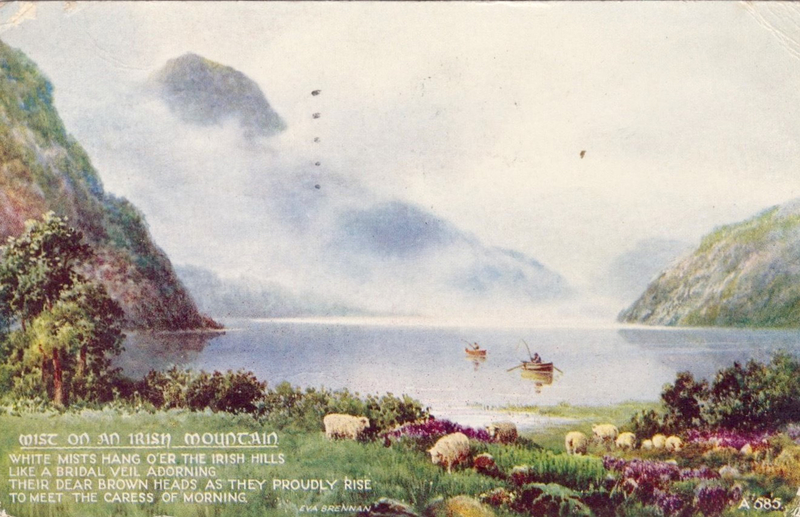 However, the overriding characteristic of Irish mountains is that they often sweep steeply down to the sea or to a lough and are therefore visually spectacular in their settings. We live in the far south-west: our mountains form the backbone of each of the peninsulas: The Mizen, Sheep’s Head, Beara, Iveragh and Dingle, largely Old Red Sandstone with some Carboniferous Limestone north of Killarney. 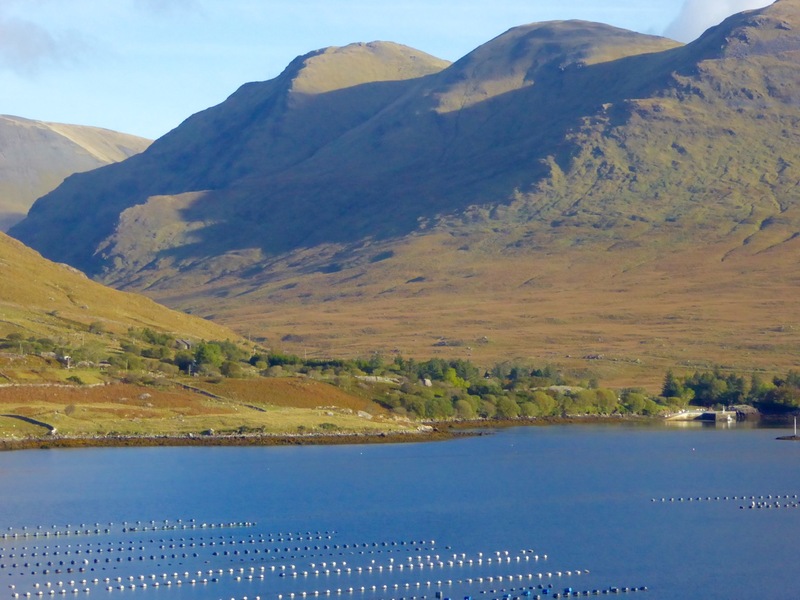 Our travels took us up to Clare – very distinctive exposed limestone ‘pavements’ and mountain tops – and then to the complexities of granite, schists and gneisses found in the district of Connemara. 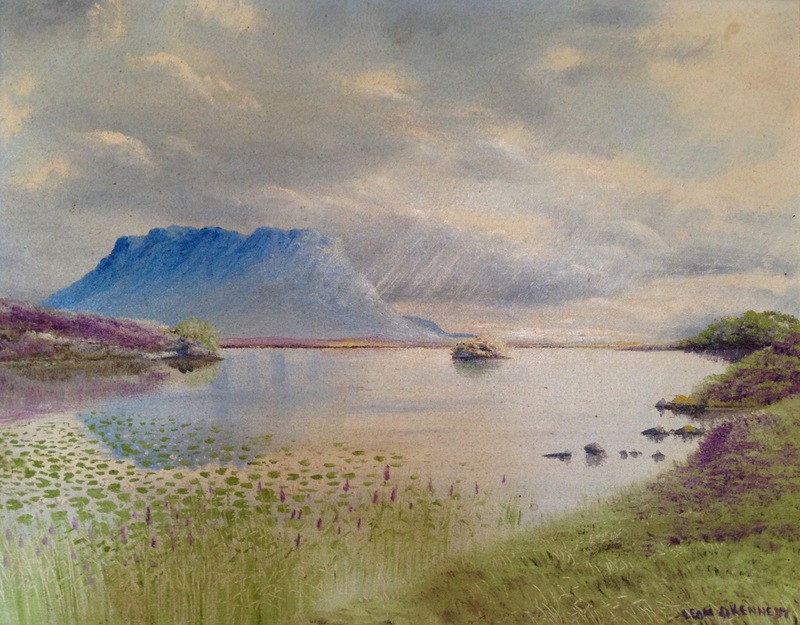 The Irish landscape -and, particularly, her mountains – has long been the inspiration for artists and poets. The work of Paul Henry (1877 – 1958) is sparse and flat, yet expertly captures the character of the high lands of the west. It has been used over and over again in tourist advertising campaigns. 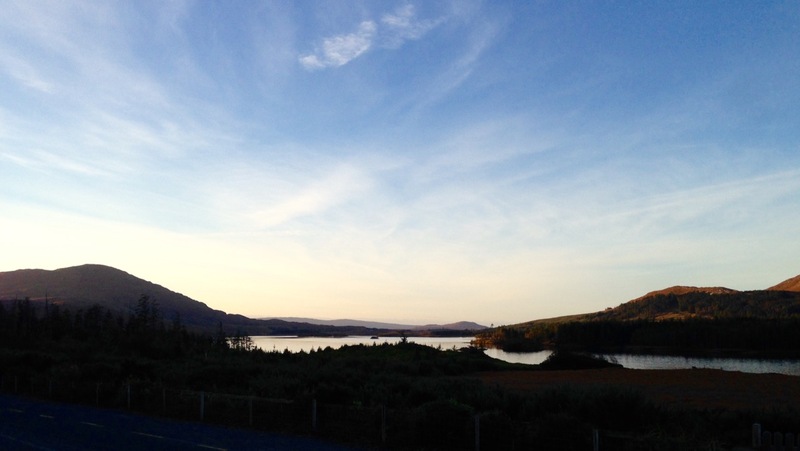 We stayed in the Lough Inagh Lodge – a comfortable hotel with great character and superb views to the mountains. There I was pleased to discover two original oil paintings by Leon O’Kennedy (1900 – 1979), a little known artist who travelled mainly in the west of Ireland and, evidently, sold his work by knocking on doors. 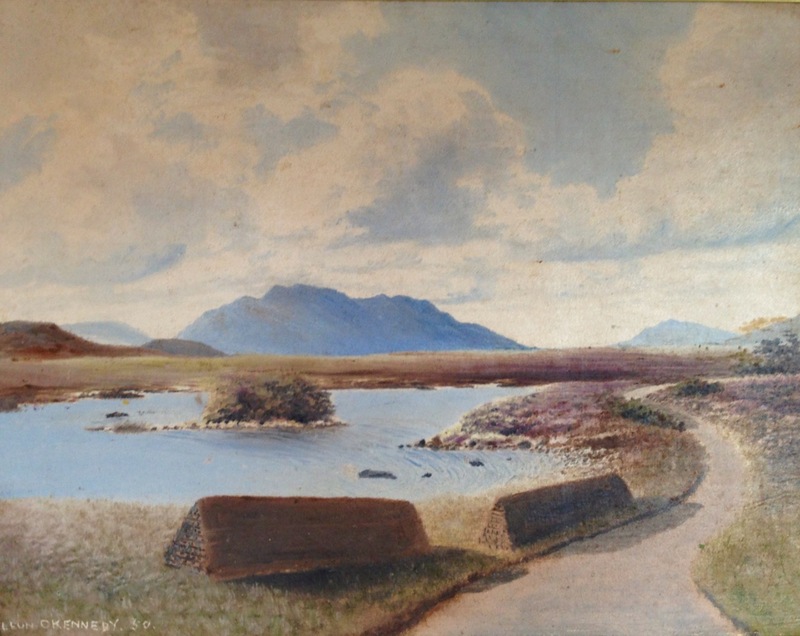 The hotel’s paintings might have arrived in this way as they depict local views: the prism shaped peat stacks are still very much in evidence in Connemara. 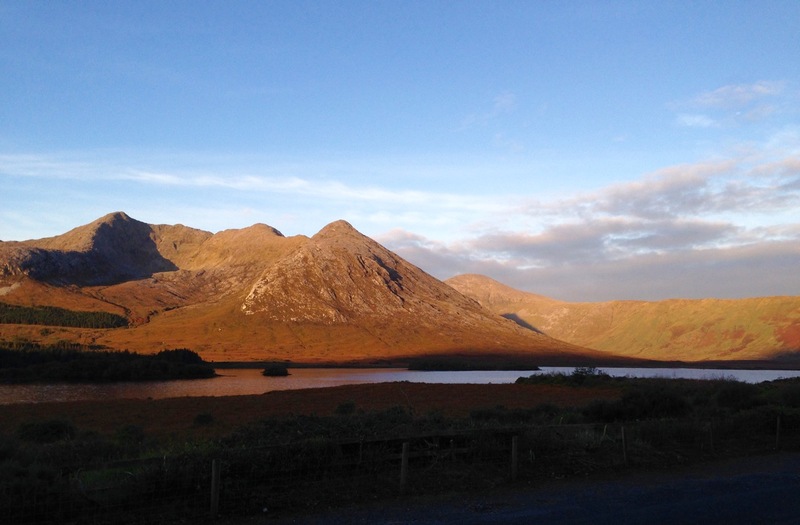 Connemara (which derives from Conmhaicne Mara meaning: descendants of Con Mhac, of the sea) is partly in County Galway and partly in County Mayo, in the province of Connacht. We were there only two days and barely did it justice. We intend to return and get to know it more intimately. In terms of our tour of Ireland’s mountainous districts it was the icing on the cake, but that in no way lessens the particular beauty of the other places we encountered – the strangely haunting limestone heights of Clare and the perennial grandeur of Killarney: all are experiences not to be missed. This entry was posted in County Clare, Irish Art, Irish Landscape, Kerry, Nature, Visiting Ireland, West Cork Blog and tagged Carrauntoohil, Conmhaicne Mara, Connemara, Corrán Tuathail, Geology of Ireland, Ireland's Fjord, Ireland's Mountains, Killary Harbour, Lakes of Killarney, Leon O'Kennedy, Lough Inagh Lodge, Paul Henry, The Burren. Bookmark the permalink. I had not see this excellent post yet, came across it when looking up things on the geology of Ireland. What amazingly beautiful photos of, yes I recognise the beauty of the mountains and have seen these colours before there. Thanks for an interesting and beautiful posting. 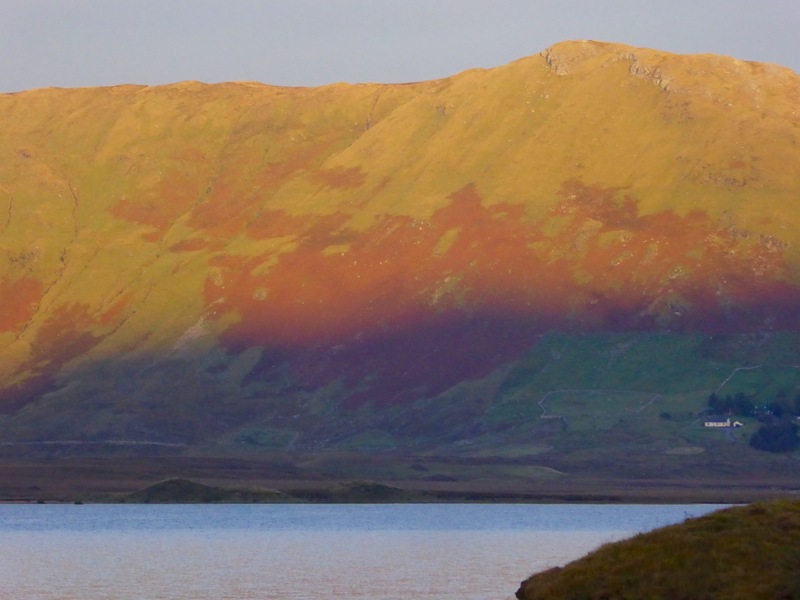 Thank you – your comments made me re-read my post again and realise, once more, what a beautiful land we are fortunate to live in! You are so right Robert, a blessing! Just beautiful! How lucky we are. Always interesting. Always beautiful. Thanks! Sensational landscape and some wonderful photos and paintings – the O Kennedy paintings are a real find. 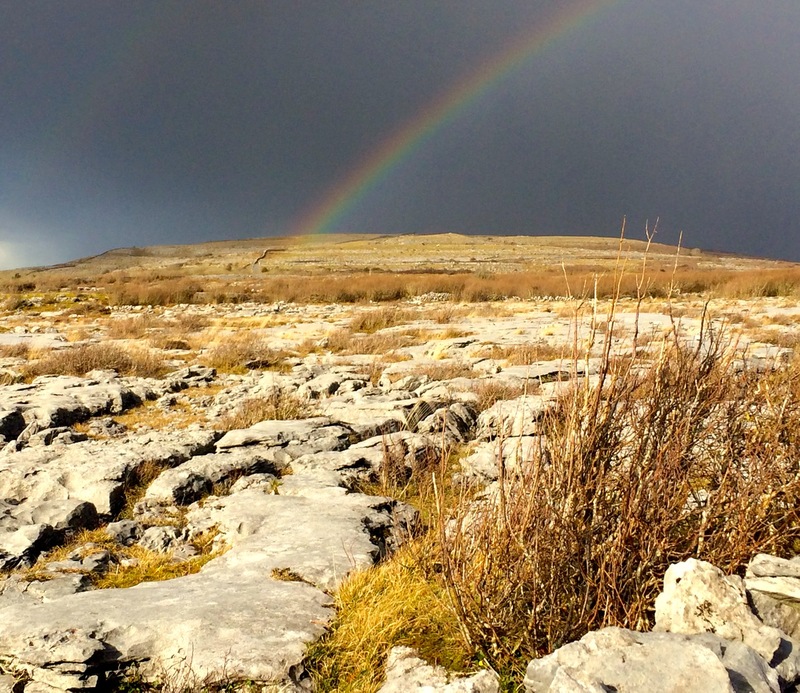 The Burren and rainbow is pretty impressive too. And where was the rag tree? 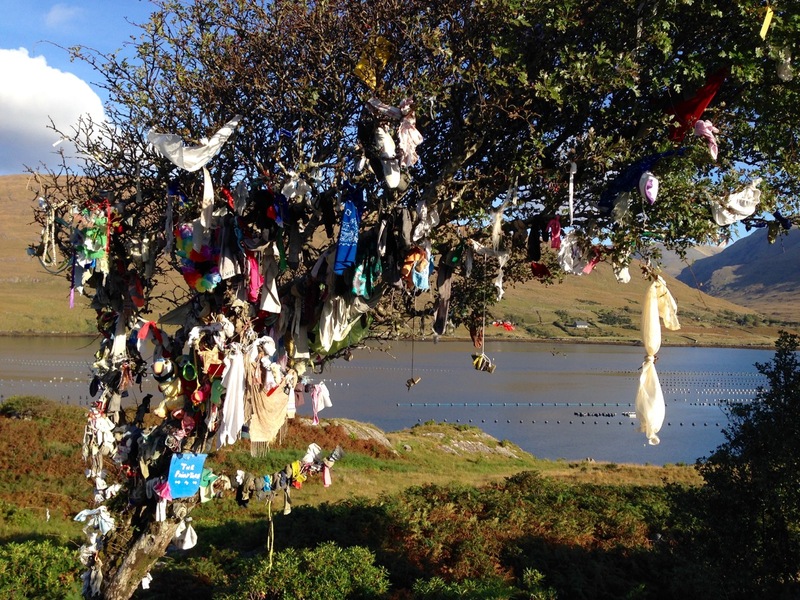 The rag tree was on the shore of the fjord, Amanda – there were two of them. I don’t know if there is any tradition of a holy site there, but thorn trees are special wherever they are, as you know. And – I’d forgotten about that reference to thorn trees in the Allingham poem: very apposite!